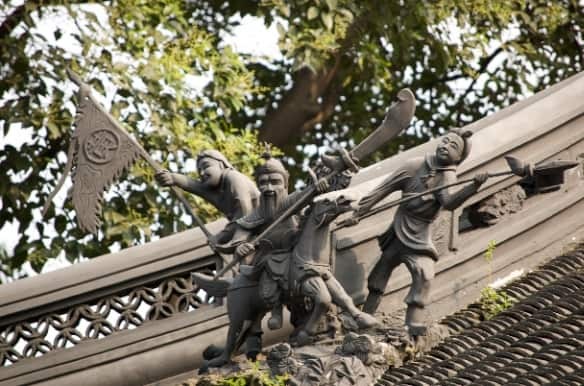 For all the historical references that remain in Shanghai there were many traditional Chinese historical treasures that did not survive the Cultural Revolution. 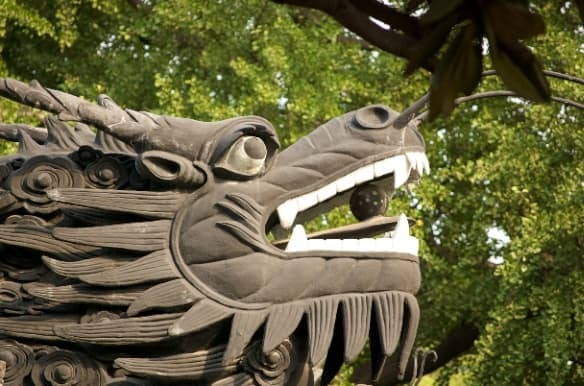 A little like the main historical sites like the Forbidden City and Summer Palace in Bejing some of the historical places in Shanghai have been rebuilt for posterity rather than you being able to experience the real thing. 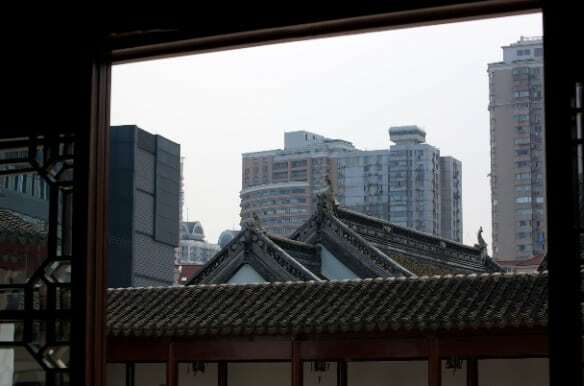 I am however fascinated by the traditional Chinese architecture. The wavy tiled roofs. The ornate carvings to ward off evil spirits. These evoke an exotic feel and bring a sense of the Chinese culture to buildings that are simply not achieved in this modern time. 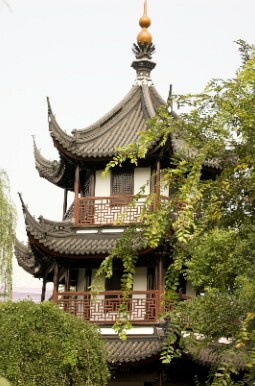 The Temple of Confucious was a great example of an ancient Chinese building. 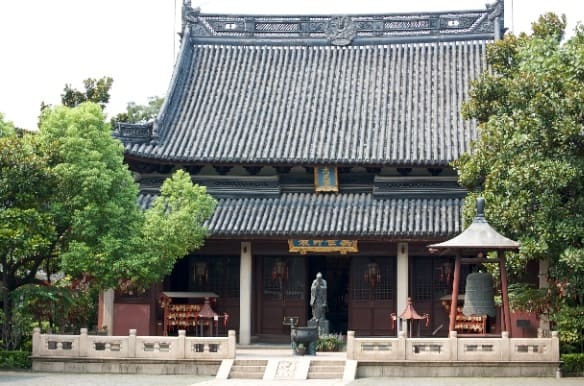 This is not a religious temple (confucious was a scholar not a preacher) but it has the reverence of a Temple. The cool calm courtyards and pagodas. 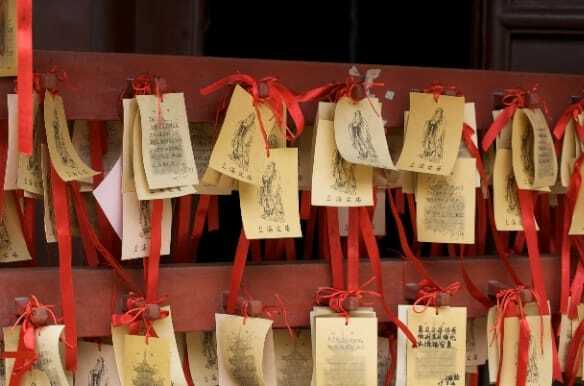 Chinese still visit this site to bring themselves good luck. Apparently students about to take exams will come and write a good luck message to themselves. 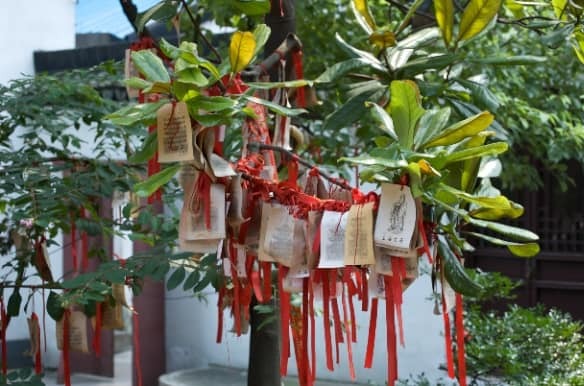 And they’ll then return after exam success and hang their charm on the trees in recognition of the good fortune it has given them. You can’t help feeling a sense of place and history. Inside the walls of the Temple there was peace away from the ravages of the outside world. 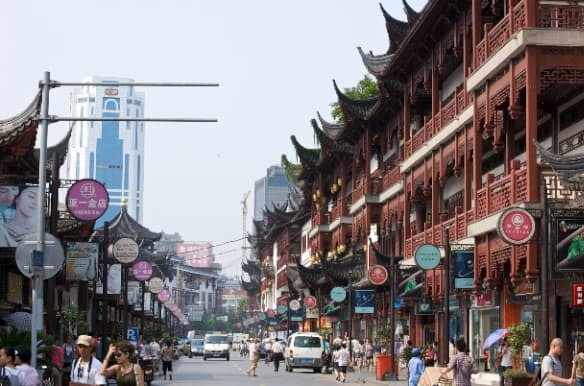 There was however a less attractive side to replica Chinese development which I felt was more like Disney Land but clearly the Chinese love it as it was teeming with people eating, shopping, gawping and participating in a wide range of carnival type activities. This was the ultimate tourist destination for Chinese and foreign tourists who could spend all their money on absolute tat. It was a hustle and bustle place that probably would have been more fun if we hadn’t been quite so hot and tired by this point in the day. I have to admit I was relieved to escape back into the normal chaos of Shanghai. 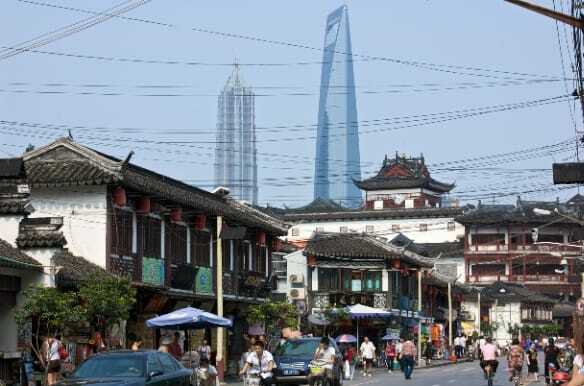 Wherever you turn in Shanghai it’s hard to miss the juxtaposition of the old and new. For all it’s contradictions it seems to work. Personally I like the historical context more. It brings the modern life into more perspective. It reminds you that we are here for just a moment in time but that what we build remains for very much longer. I hope that in their quest for modernity that the Chinese don’t lose too much sight of the past that has shaped their culture. This is a society that stretches back for thousands of years and it would be a shame if the they adopted too many of the modern ways. 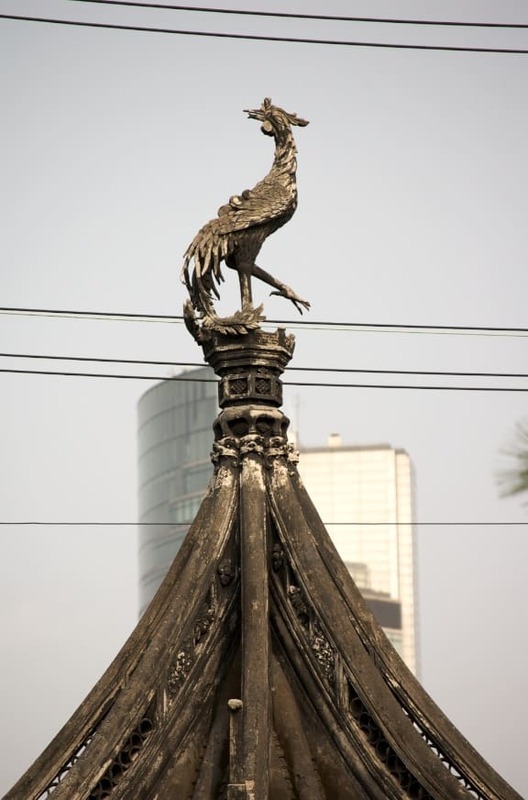 For me this photo of the Fenghuang (a phoenix like bird) that symbolises high virtue and grace is still towering over the modern building of Shanghai. Although this is just the photographic perspective it does for me sum up the potential contradictions of China right now. Seeking to maintain it’s cultural roots but compete on the same terms as the rest of the world. I hope that the Fenghuang isn’t slane eventually for the skyscraper otherwise Shanghai, and probably the rest of developed China, will lose the magic, the exotic, the soul of what makes China a special place to be. Ah, fabulous! Now you have me hooked and keen to explore Shanghai one day. It is the history that would interest me the most and it is sad so much was lost in the Cultural Revolution.